More than 60 BPA members arrived in Germany in September for what proved, once again, to be a hugely successful exhibiting experience in the UK Pavilion at one of the world’s largest nursery trade shows – Kind und Jugend. The UK Pavilion was bigger this year than ever before covering a massive 2500 square metres dominating Hall 11.1 of the Koelnmesse exhibition centre with its eye-catching British branding. The central networking and catering area was the hub of the UK Pavilion with a constant buzz of activity throughout the show. Not more so than at the close of business on the first day when British exhibitors, buyers and the press gathered for the BPA hospitality and networking evening attended by around 300 guests. 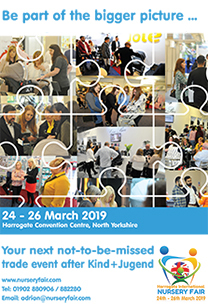 As always, this event was not only great fun, but gave the opportunity for early feedback and information sharing allowing exhibitors to regroup and plan their sales strategy for the remaining days at the show. 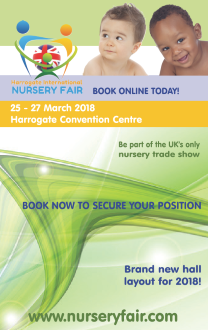 Thanks to UKTi Enhanced activity funding and the support of the nursery trade press, promotion of the UK Pavilion was at an all-time high reaching a much wider audience with a number of articles both in print and online published in the months running up to the event. 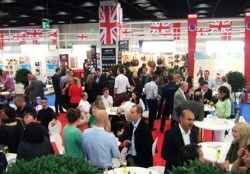 The BPA also issued e-bulletin newsletters to a database of international buyers and retailers worldwide prior to the show, highlighting the diversity of products and brands in the UK Pavilion. A UK Pavilion Directory issued prior to the show was also available to download and for visitors to pick up at a number of points throughout Kind und Jugend. The simplicity of this publication with a clear UK Pavilion map and listings of all of the companies exhibiting was commented on by numerous visitors who found it a valuable resource when locating suppliers. It also appeared that the Union flag is the latest ‘hot trend’ if the take up of the bags kindly sponsored by BabaSlings were anything to go by. These bright cotton bags emblazoned with the flag on one side and the BabaSling and UK Pavilion logos on the other were literally snapped up like hot cakes with visitors even making special trips to the BPA stand to try and secure one for themselves. For the first time, the BPA organised a seminar within the UK Pavilion with market research company GfK delivering an enlightening presentation on latest market trends in both the UK and worldwide nursery industry and in particular the effect that the royal birth this summer has had on the market as a whole. This was well attended and obviously a subject of much interest with many of the delegates asking for further information after the event. It is also apparent that whilst the UK Pavilion continues to be an asset to the larger companies which achieve a much greater presence under the united UK umbrella, for many of the smaller companies which are new to the market, the support and advice of experienced exporters proves to be invaluable.